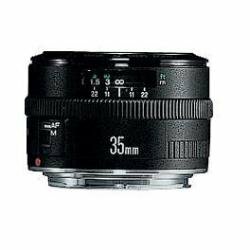 Canon EF 35mm f/2 Wide Angle AF Lens [SHD-LEN-003] - €20.00 : Shadeena Rentals - The more you rent, the less you spend! Versatile design A minimum focusing distance of just 25cm enables photographers to get closer to their subjects while retaining a more natural, wide-angle perspective. The lens' fast aperture means depth of field can be restricted for blurred backgrounds and photographers can shoot hand-held even when light levels fall. Fully Electronic Lens Mount An integrated AF motor provides fast autofocusing performance. The lens' electromagnetic diaphragm ensures incredibly accurate control over aperture positioning. Super Spectra coating Super Spectra coatings ensure accurate colour balance and enhance contrast. They also reduce flare and ghosting - a common problem caused by light bouncing off a camera's sensor.